Motor to Bisevo off the west end of Vis to see the Blue Cave. Water is deep offshore so I stay aboard and the girls take the dinghy to the cave and paddle in. I go with them for a second trip and Mags stays aboard. Fee of 30Kn is charged. 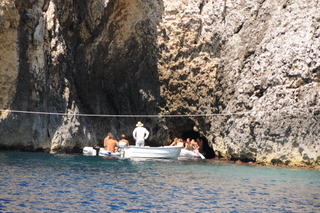 One other boat was leaving the cave when we entered. The cave is beautiful. Light enters the cave for two hours at midday through reflection off the bottom near a submerged entrance at the back of the cave. The water is bright blue and perfectly clear. We dove off the dinghy and swam about - pretty cool.